Being in business is always challenging and to survive and flourish in the competitive business environment, we need to recognise when we need assistance. 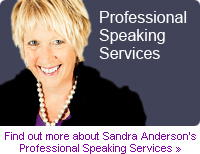 The team at Sandra Anderson Small Business Specialists are professionals with first hand experience of self employment and management. Over a number of years we have developed many tools to assist business people who have used these to successfully grow their business and themselves. These include a proven Coaching programme and specialist training programmes developed to assist businesses either for Management or Staff. As a Certified "Whole Brain Thinking" Practitioner we are able to take an individual or a team to a new level of operation. This work has given us the opportunity to help people think outside the square and gain a whole lot more from work and play. Our systems are simple and easy to implement. By following our simple steps you will be able to achieve great things in your business, no matter how big or small your business is. Our philosophy is simple; you the client are the most important aspect of our business. With our qualified teams' skills and experience we are able to tailor a programme to suit your needs. If you want to achieve growth, we are the people that can help you grow your Business.